Crew were rescued this morning following a fire on a wind farm support vessel off Great Yarmouth. A crewman has been airlifted to hospital this morning after a fire on board a wind farm support vessel 4 nautical miles off Great Yarmouth. Humber Coastguard received a call from the vessel Norfolk Tern just after 8am reporting they had a fire in their starboard engine. They had managed to bring it under control, but one crewman was believed to be suffering the effects of breathing in too much smoke. The Lowestoft and Gorleston Coastguard Rescue Teams, the search and rescue helicopter from RAF Wattisham along with the RNLI all-weather lifeboats, from Lowestoft and Gorleston, were sent to the scene. The injured crewman was winched on board the RAF helicopter and taken direct to James Paget University Hospital. With the lifeboats standing by, the 5 other crew members stayed on board the Norfolk Tern to help bring the vessel into Great Yarmouth. 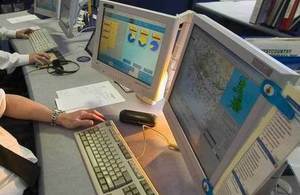 They were met there by Coastguard Rescue Officers, along with ambulance and fire crews. All 6 on board this vessel managed to quickly bring the fire under control, but one member of the crew was in need of medical attention after showing signs of breathing in too much smoke. The standby vessel Vos Discovery also provided excellent support in transferring oxygen for the injured person.